It’s hard to argue that broccoli is anything but one of the healthiest foods we can eat. Broccoli has been one of the very popular vegetables in the United States originated laterally from Europe and become popular in Italy. Broccoli is a good source of antioxidants that are an essential ingredient in any kind of diet, equally for adults as well as kids. It is a member of the cruciferous family of vegetables also includes cauliflower and cabbage. Broccoli contains a complete nutrition and many important chemicals that sustain the body such as anti-inflammatory nutrients, detox-support nutrients, antioxidant nutrients, and anti-cancer nutrients. 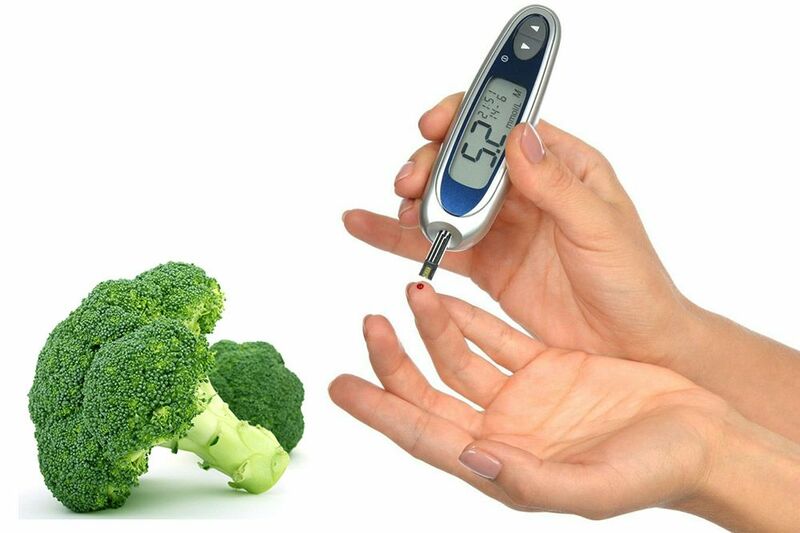 Broccoli a secret weapon against Diabetes. Let’s see how it prevents diabetes and keeps you healthy. Is broccoli a secret weapon against diabetes? Broccoli is rich in vitamins, minerals, phytonutrients and dietary fiber and is most nutritious if eaten raw. Broccoli is good for diabetes treatment and control, because of its excellent nutritional qualities. Diabetes is a disease which has affected millions of people all over the world. According to a study, Broccoli contains an ingredient that can help those with type 2 diabetes control their blood sugar level. The most promising chemical sulforaphane, a naturally occurring compound found in cruciferous vegetables. This chemical is thought to be responsible to lower glucose levels in earlier lab experiments on diabetic rats. Next, the researchers tested broccoli sprout extract on 97 obese adults in a 12-week, randomized, placebo-controlled trial. All adults had been diagnosed with type 2 diabetes and had poor control of their blood glucose levels. Compared with adults who did not consume the broccoli sprout extract, those who did consume the extract showed a significant reduction in fasting blood glucose levels. Sulforaphane is also present in other cruciferous vegetables, including cabbage and Brussel sprouts. Broccoli is beneficial for type 1 diabetics too. It will, however, not be able to reverse the disease, but can help in maintaining a healthy cardiovascular system by the action of its antioxidants and phytochemicals. Type 1 diabetics will have to continue taking their insulin and other medications as prescribed by their physicians. Diabetes is a disease where the body cannot absorb glucose from the food it digests. This is due to problems with insulin, a hormone produced by the pancreas, which is needed to absorb and utilize glucose from the blood. This leads to abnormally high levels of sugar in the blood which can have potentially fatal consequences. To identify suitable compounds to examine, researchers used computer models to identify gene expression changes linked with type 2 diabetes, and then sift through thousands of chemicals that might reverse these changes. Extract of the vegetable may help patients regulate their blood sugar levels. In the studies, it has been found that eating or drinking broccoli in the form of juice could help more in some cases. Diabetes causes damage to the blood vessels, increasing their risk of suffering from heart disease, heart attack, and stroke. Sulforaphane in broccoli can help keep the heart healthy, lowering the risk of heart attack and stroke. It also has potent anti-cancer properties and works by increasing liver enzyme levels that are responsible for the destruction of cancer-causing chemicals in the body. According to experts, consuming high amounts of broccoli reduces the risks of developing breast, ovarian, lung, colon, prostate and bladder cancer. Broccoli is rich in fiber, which helps with digestion and works in dealing with or even preventing constipation. Broccoli is a good source of vitamin A that is needed to form retinal, the light-absorbing molecule that is essential for both low-light and color vision. Studies have shown that the carotenoid lutein helps prevent age-related macular degeneration and cataracts, as well as possesses anti-cancer effects. The carotenoid lutein present in this vegetable may slow down or prevent the thickening of arteries in the human body, thus fighting against heart disease and stroke. The Vitamin B6 and folate in broccoli also reduce the risk of atherosclerosis, heart attack, and stroke.